When 33-year-old Japanese architect Miwa Mori was a student in Germany, she learned a lot about architecture by observing fashion. “In winter in Germany, people wear t-shirts inside and put on a heavy jacket to go out. In Japan, we bundle up inside and put on a light coat to go out,” she notes. That’s because German houses are some of the most energy-efficient in the world, while the minimalist wonders we swoon over in Japan usually have poorly-designed skins that let in cold air during winter and hot, humid air during summer. Now Mori is back home and on a mission to build more comfortable homes. At Key Architects, the firm she runs with husband Joerg Heil, she’s blending the super-energy-efficient design skills she learned at Germany’s Passivhaus (or Passive House) Institute with traditional Japanese building methods—and reducing the carbon footprint of the country’s energy-sucking residential sector while she’s at it. This house for a family of four in Kamakura, near Tokyo, was the first in Japan to receive Passive House certification, an international standard for energy-efficient housing. It was designed by Mori and completed in 2009. “The Passive House system is about achieving affordable energy-efficient houses. You reduce mechanical services—like heating systems—and put that money towards insulation and thermal performance, so you lower costs and achieve a high level of comfort,” explains Mori. The traditional charred cedar facing shown here (great for repelling insects and rain) hides a sandwich of plastic sheeting and insulation that keeps temperature and humidity stable with only occasional resort to active heating or cooling appliances. Until now, Passive House design hasn’t taken off in climates that are cold in winter and humid in summer because the plastic sheeting that keeps out cold air can trap moisture inside walls and cause mold. Mori used a German-manufactured “smart vapor barrier” that breathes in the summer to solve the problem. Carefully placed triple-glazed windows and 9-inch-thick insulation (shown here) also reduce the energy footprint. Building small took total energy consumption and cost even lower. With 1,000 square feet of floor space, the house cost 10-25% more than a conventional home of the same size, but the family has lower-than-usual utility bills. “With proper design, small homes don’t feel cramped. We’re not scared of small!” says Mori. “The Passive House is nothing special in Europe now. They’re moving on to carbon neutral,” says Mori, who absorbed that attitude over ten years of study and work in Germany and Ireland. While a student at the University of Stuttgart, she designed this sculpture made from 2,000 feet of inflated sausage tubing. In 2004, Mori joined Bucholz McEvoy Architects in Dublin, where she worked on the firm’s acclaimed Elm Park project. The high-density mixed-use development incorporates natural ventilation, daylighting, and other sustainable building technologies. “This was my little baby for four years,” says Mori. Mori served as an energy consultant for this carbon neutral house in Yamagata Prefecture, designed by a team at Tohoku University of Art and Design, where she teaches, and funded by the Environment Ministry. The house meets Passive House standards, uses wood pellets for heating, and has a solar water heater and solar panels on the roof. It was completed this March. 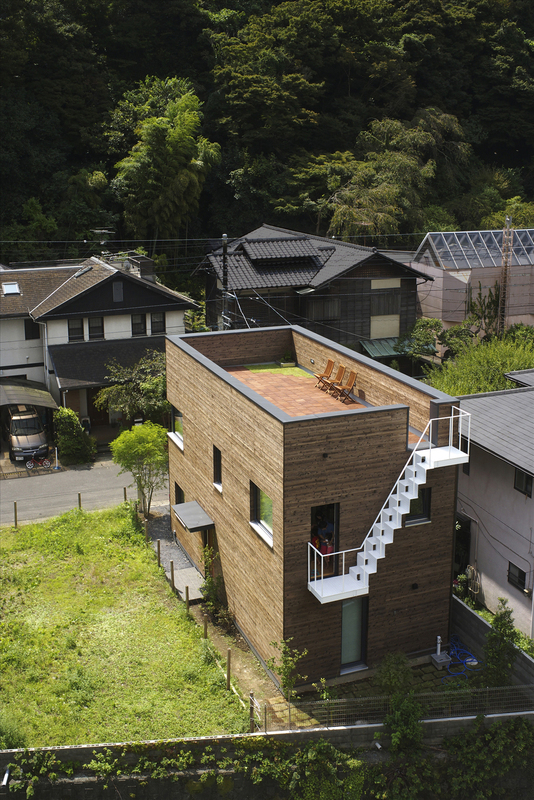 The project, which used locally-harvested wood and a natural plaster finish, brought Mori closer to her vision of combining modern Passive House design with Japan’s traditional building heritage.